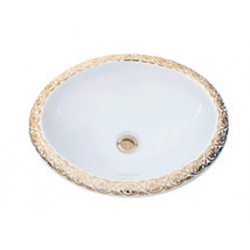 A border is always a good choice when thinking about adding a subtle, custom touch to the sink or basin in your bathroom. 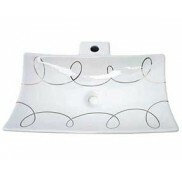 They work great on an undermount coordinated with a marble or stone countertop and traditional vanity, but can also be fabulous on the front of one of our flat front vessels. We have several options from silver and gold borders to leopard, faux stone and marble. 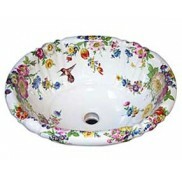 Something for every bathroom interior. Customize your bathroom with this marble border painted on the sink. Elegant faux black marble looks..
Customize your bathroom with the look of marble and the durability of a vitreous china sink. 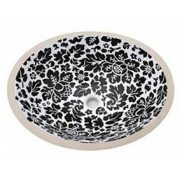 Faux ma..
Classic Italian Florentine design painted on a contemporary slab style vessel sink. Design is compos..